Want to know how to get silky smooth hair for Summer? This is your lucky day. Not that we have much of Summer left, but let us be hopeful that the sunshine will hang around for a little while longer. I look at shampoo adverts on the TV and browse magazines and envy those girls with silky smooth hair. After the birth of my little tot, silky smooth hair seem to be near enough impossible to obtain. Any mom would know that your hair density and condition deteriorates after birth sadly enough. The actual statistic is 50% of moms fall into this category. I guess I fell into that 50%. That was of course until I met Roots and Rituals and these aren’t just your usual hair products, these are natural, luxurious and effective products that ”do the job”. It was founded by Karishma Mahtani who from working in the pharma industry realised that products are filled with a bunch of harsh chemicals and she wanted to create something natural yet at the same time effective. Her ethos and message is centred around bringing Eastern rituals to the modern West world and combining this with science to produce a perfect blend of natural oils for hair treatments. Over 4000 years ago, in the ancient East part of the world, families would gather together for healing practices of Indian head massages. This involved relaxing scalp massages using the application of touch pressure to points in the scalp using a blend of oils with the ‘side effect’ being beautiful and radiant hair. Roots and Rituals uses a combination of balancing oils to create the perfect potent treatment. Thanks for the fabulous hair treatment oil and hair mask, it has done wonders for my hair. The down low on both products. Want to know how to get silky smooth hair? Get yourself a cuppa and give yourself five minutes to have a quick read on this below. -Enriched with wheat protein and a number of oils; Kernel oil, coconut oil and fruit oil to name a few. -Contains a whopping blend of 15 oils, yep you read that right! -For those grey-haired girls (me included), this product also contains a blend of oils which specifically targets premature hair greying and also helps reduce hair loss. -Apply 10mls to dry hair for 30-40 minutes and wrap hair in a towel or shower cap to aid penetration of oil and wash off after this time. I like to leave it overnight sometimes as I have extra dry hair. -Don’t forget to give the scalp a good old massage in circular motion. Warning: Try not to doze off whilst applying. The smell of the blend of coconut and avocado oil could easily send you off snoring the night away. 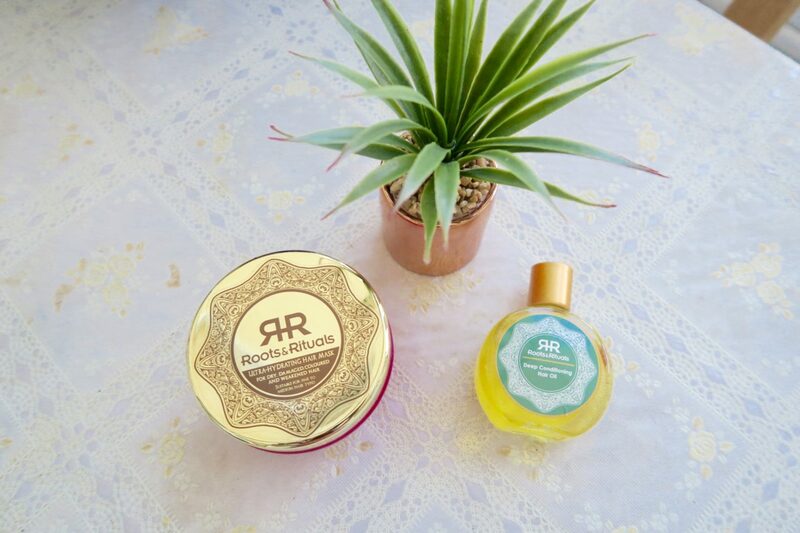 If you are on the hunt for new and natural hair care products then Roots and Rituals is a must try. Results will vary with different hair types but that is with any hair care product to be honest. I give these products an overall thumbs up. I have used many SLS-free, paraben and chemical-free products and it has left my hair feeling lifeless and even drier funnily enough. Roots and Rituals gave me smooth, healthy and radiant hair from just one application so I would definitely recommend these to any dry hair sufferers out there. My motto: Always go natural! Make hair treatments a ritual in your life! A good hair care routine is an absolute must especially now in the Summer with it being that there is more sunshine around (or not if you live in the UK) and more beach trips. Both of these of course are damaging to the hair. What are your go to natural hair products? Do tell and share.